Coach Al Sokaitis and Brad Oleson provide an outstanding assortment of drills designed to develop advanced level skills at both ends of the court. This comprehensive program includes a variety of drills to improve shooting, conditioning, footwork, speed and power, one-on-one play, ball-handling, dribbling, defense, rebounding, and more. 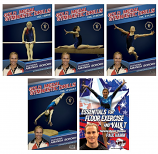 This DVD is must have resource for any player who would like to improve their game. 40 minutes. About the Coach: Al Sokaitis has been coaching basketball for over 30 years. He has established records for the most wins at five different schools, and been named Coach of the Year on ten occasions. He has lead three different colleges to the NCAA Tournament. Currently, Al Sokaitis is the Head Basketball Coach at Western State College in Gunnison, Colorado. Learn to be a great shooter with the help of former NBA shooting coach John Townsend. 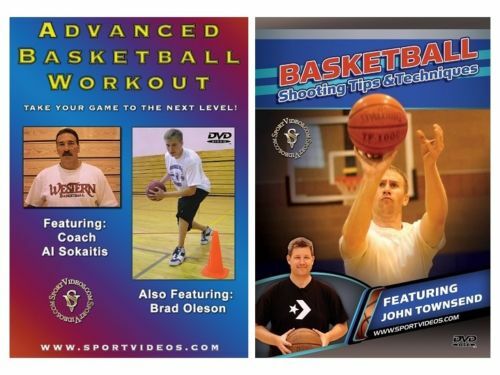 In this DVD, John teaches several unique fundamentals and principles of shooting a basketball with the emphasis on eliminating left and right misses. Among the topics covered are: the position of the feet, hands, wrists and elbow, follow through, shooting drills, how to shoot free throws, a spot shooting workout and how to monitor and record your practice. Everything presented in this program can be incorporated into individual or team workouts. Players at any level can benefit from this DVD and discover how to shoot the ball straight. John Townsend is an NBA shooting coach. He spent three seasons as the full time shooting coach for the Portland Trail Blazers. During his tenure there, the Trail Blazers set franchise records in 3-point shooting and free throw shooting. John has worked with over 100 NBA players including two number one picks and three NBA All-Stars. John has been the basketball shooting coach for the NBA Players Association Top 100 Camp as well as the NBA Development League. He has worked with basketball players on their shooting around the world doing clinics and individual work in Ireland, Northern Ireland, Jordan, Singapore, United Arab Emirates, the Philippines, Spain and England. Coach Townsend also invented the "Str8shooter", a basketball shooting device that helps to eliminate ulnar and radial deviation of the player's shooting wrist, allowing the player to shoot the basketball straight.